Real Madrid pushed aside their recent problems with a convincing 4-1 victory over Getafe at the Santiago Bernabeu. 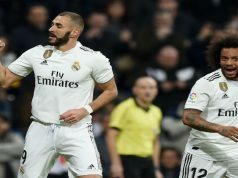 Goals from Gareth Bale and Cristiano Ronaldo and a brace from Karim Benzema ended a turbulent week in which Real had been eliminated from the Copa del Rey for lining-up suspended Denis Cheryshev. It didn’t take long for Los Merengues to take the lead, as Benzema made it 1-0 with four minutes on the clock. Pepe delivered a sensational cross towards the Frenchman, who had the simple task of volleying home from inside the box. The France international scored his second only ten minutes later as he worked some space inside the box and fired one into the bottom corner. It is terrible defending from Getafe, who didn’t have a good start to the game. Rafa Benitez men were impressive going forward in the first half, and they scored two more goals before the break. 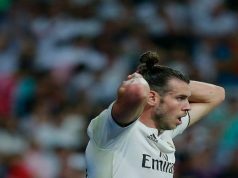 Bale collected a knock-down from Ronaldo and worked some space before firing his effort into the bottom corner to make it 3-0. Four minutes later, Ronaldo collected a wonderful through pass from Toni Kroos before and sent his effort across Guaita and into the bottom corner. The victory was sealed, and so Los Blancos played more relaxed in the second half, allowing Getafe to dominate possession. The visitors had their goal with 20 minutes to go as Alexis rose inside the box and angled a superb header into the back of the net. That was the only real chance of the second half, which was pretty boring for the Santiago Bernabeu fans.